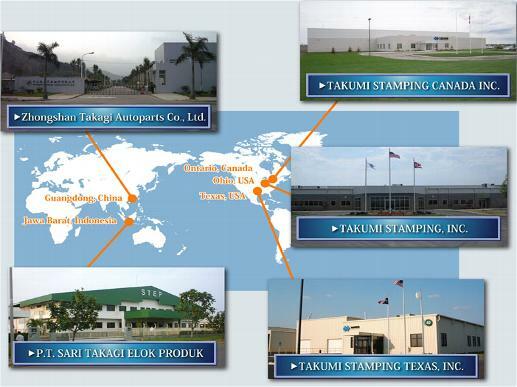 About Us - TAKUMI STAMPING CANADA INC.
TAKUMI STAMPING CANADA INC. is a subsidiary of Takagi Manufacturing Company Limited, of Okazaki, Japan. Takagi Manufacturing Company was established in 1890 and incorporated in 1948 and currently has manufacturing operations in Ohio and Texas. Globally, Takagi is also located in Zhongshan, China; Jakarta, Indonesia, and in Okazaki, Japan. TAKUMI STAMPING CANADA INC. manufactures stamped metal parts for Toyota Motor Manufacturing Canada's new Woodstock facility. With plans to grow our business to other customers in the region, we plan to become a major supplier in the manufacturing industry. Our new facility in St. Thomas is state of the art with the latest in stamping machinery and production processes. TAKUMI STAMPING CANADA INC. believes in achieving our goals through continuous improvement, SIX-SIGMA processes, and team values. The DMAIC process (Define, Measure, Analyse, Improve, and Control) provides for continued quality in the products we supply. This assures our customers that they receive ONLY the best. Our people are the foundation of this organization. It is through their dedication and hard work that we continue to be successful. Through them our continuous improvement process works. St. Thomas, Ontario was chosen as the Company's Canadian Headquarters based on being within an hour's drive of the new Toyota plant in Woodstock, the city's pool of trained labour, and a local commitment to the industry.